On one hand: the huge gap between extremely poor and wealthy people, which brought me down when I finally realised it - nearly 2 weeks after I arrived! I also have to say that generally, I didn’t find people really friendly… and actually I’m glad I found some travelers with the same opinion. Even sometimes really unpleasant – especially when buying a bus ticket! 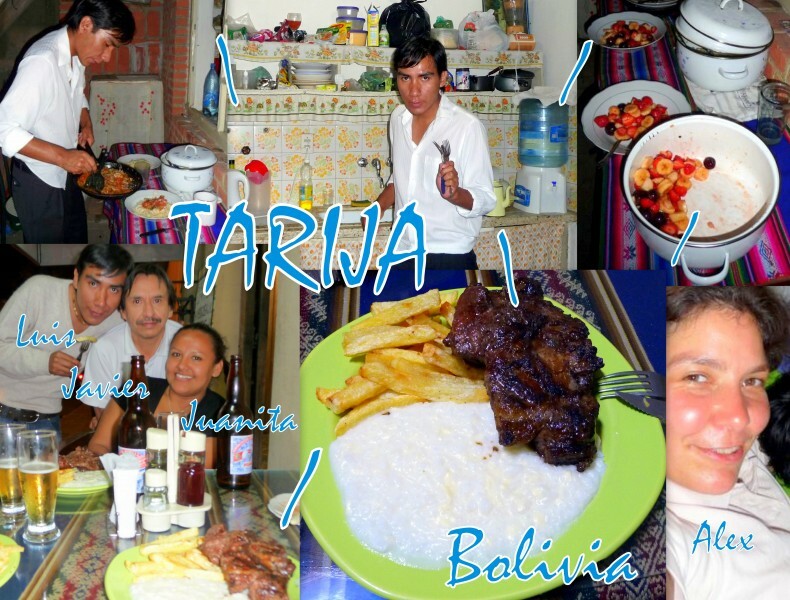 Tarija – Luis and his friends – with whom I learned the local habit to look at someone in the eyes, drink a gulp and pass on your drink to him or her ; it’s really rude to refuse! Yes I did it, even with alcohol! – as well as 1 brother and 1 sister in the hotel where I found out that the 2 daughters of the lady - leaving in Cochabamba – were dancing in the Revolution show I’ve seen! As Luis is also a Salsa teacher, I had a short Salsa course in the evening before diner - Daddy you would have love the meat! – and then we went to a farewell party of one of his friend, where I could practice! So after 2 days in Tupiza, I decided it was time to move on and took my ticket for Tarija. Road is said to be – according to Le Routard guidebook – really beautiful but pretty scary… Indeed… I now better understand why they only drive it by night! First it’s more secure – you can see car, bus or truck coming in front – second, I guess they don’t want people to have heart attack while seeing it! We finaly arrived safely – our driver was pretty used to the road it seems! - after 8 hours drive and 1 pee stop. This one was fun! Around 12:30am, the driver stopped in the middle of which looks like a small village saying to us: baños (toilet). Most of people went out – so did I – all around the bus to alleviate themselves. 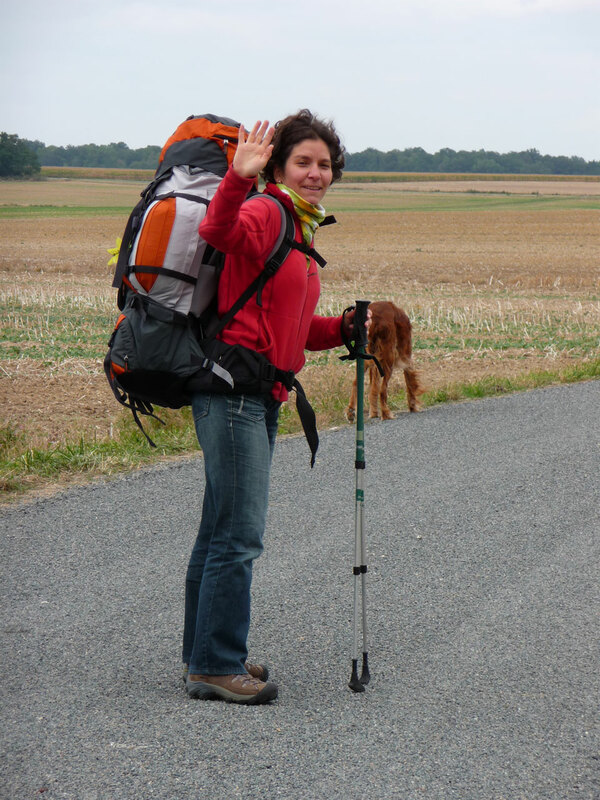 So for you guys, it’s easy, however for girls it’s another story… Fortunately – or not, as I nearly fall down in a ravine! – it was dark and it’s true that most of the locals have skirt, which help here! I guess when I will be back in Europe – or even in New Zealand – I will feel that road security is really strict! After such an adventure I did again 6 hours jeep the next day to reach Tupiza… I wanted to go there by train but it was absolutly impossible to get a ticket… After queueing for more than 2 hours – after I asked the agency to buy a ticket for me but they didn’t managed… – and meeting the women from the agency who finaly confirm that they where no train before the next Tuesday – Don’t even try to understand how does it work, absolutly crasy system! – I choose the jeep option suggested by the agency. This is the Salar jeeps doing Tupiza-Uyuni trips and leaving people in Uyuni, who drive back to Tupiza and take other passengers to make the trip back worse it! 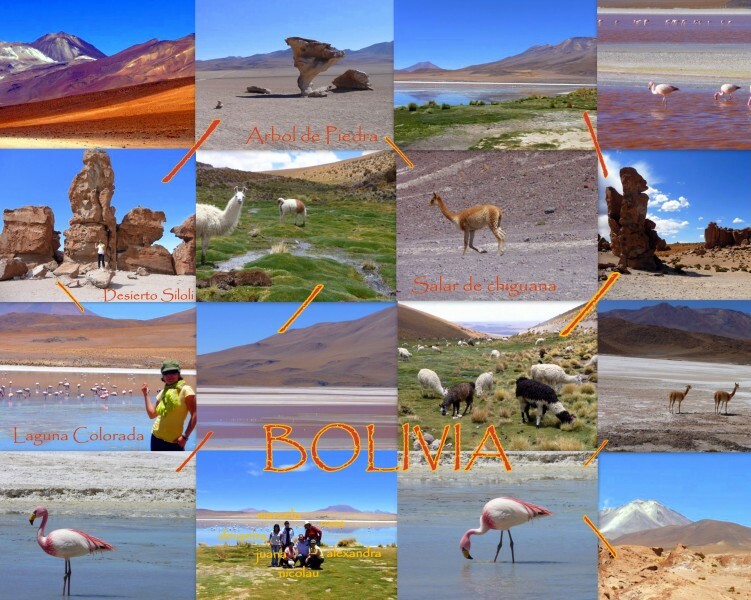 Hope you get everything… Not as fun as the Salar trip, just a taxi here, a bit more expensive but quicker than the night bus. Anyway, landscape was supposed to be beautiful… Indeed! Even with 10 people in the jeep – I don’t even know how I survived this 6 hours non-stop! But when you have no choice you do… - it was again an amasing travel! 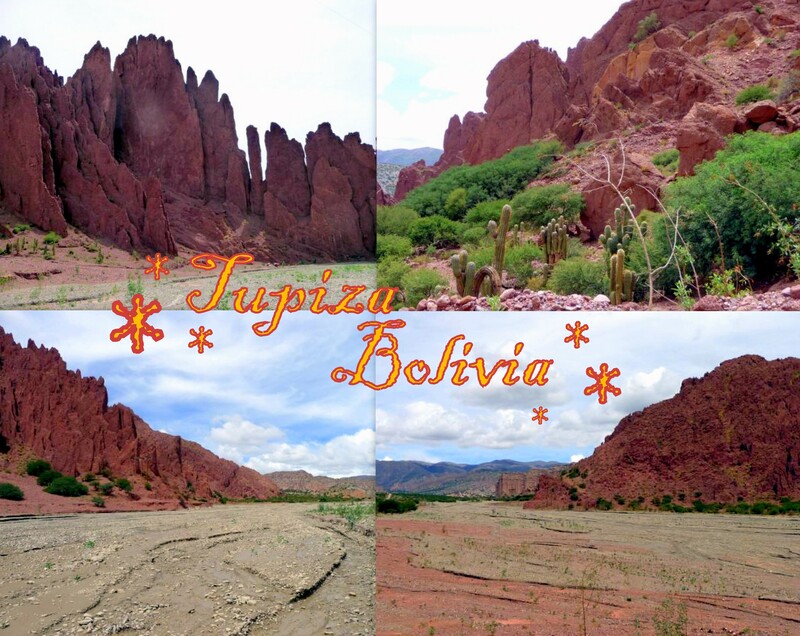 Difficult to take pictures when you’re stuck with so many passengers, so you’ll only have the one from around Tupiza which is surrounded by red mountains – beautiful. 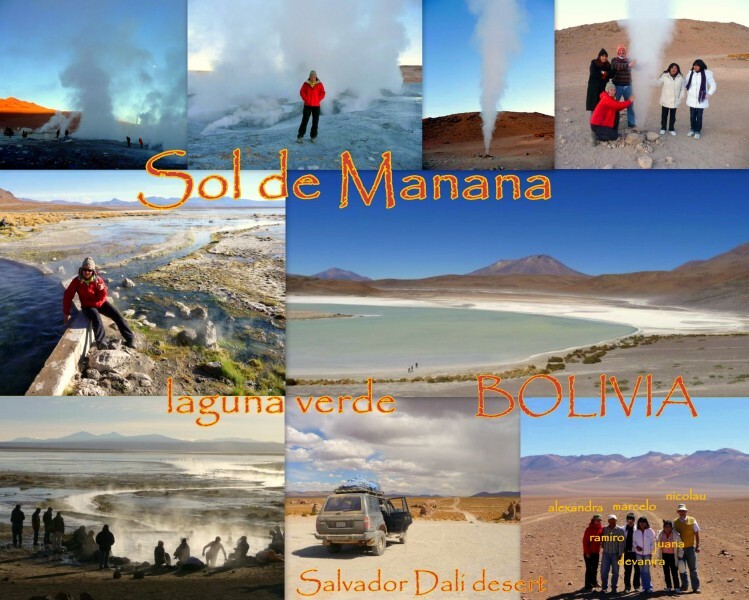 Not a really nice city where all travel agencies are looking for people to go to the Salar – I was happy to see the excitement again but sad not to be part of it! - they don’t really offer anything else than horse riding – which is pretty expensive here, nearly as Europe! – and with this heat I avoid it! So I just went on my own around the city. 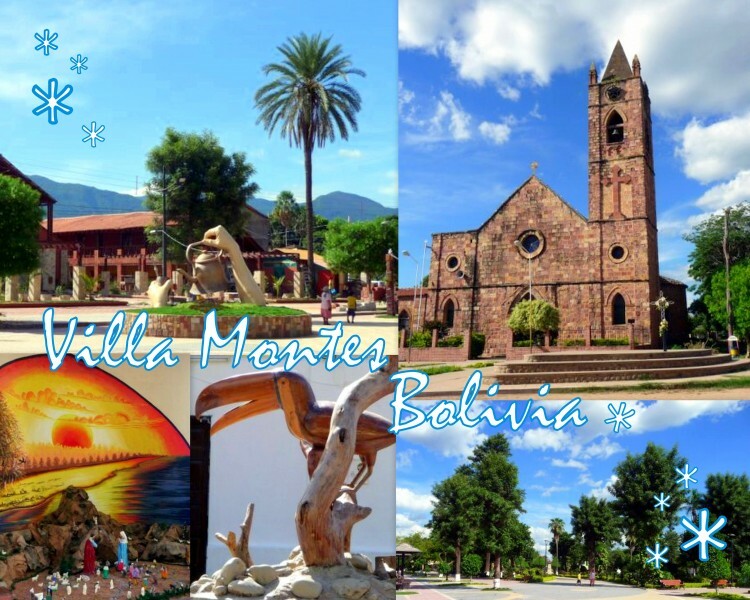 I’m leaving tonight to Tarija. Landscape is again supposed to be wonderful but by night, I’m not sure I’ll see a lot – actually it seems to be safer like that, hope I’ll survive! Next morning - after sleeping at 4315 metres hight! - wake up at 4:30am to head to the geysers Sol de Mañana. Water vapour is really hot but it was freesing cold! – lucky us it’s now summer here! Impressive! 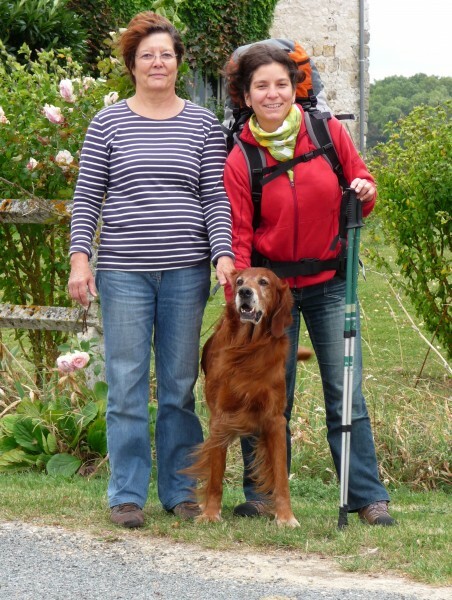 If you stay too long – even if not! – you’re cover with grey sulfur - my camero still have memories... It was great to see the sun on the mountains around and still the full moon behind the smoke… Then we head to the aguas caliente for our breakfast – yes Gregoire, we didn’t eat before leaving… But we were just sitting in a Jeep. Ok I had some bread left and everybody was happy to have a piece Except the guide, but we always wonder how they survive! – while guides are preparing breakfast, you can have a short bath but I have to say that at 7am with such cold temperature, I just put my hands in it! Breakfast settle we shortly stop at the Laguna Verde – which wasn’t verde as our guide told us it’s usualy emerald green in the afternoon… We went to the Chile border to drop off Rose & Nicolau before going back to Uyuni, nearly 8 hours drive – where I started to hate Jeep – with only 2 stops to see the so called Salvador Dalí desert and some funny rocks as well as a short natural break in a middle of llamas! Landscape were just fantastic! After such a – jeep – trip I was happy to be back in Uyuni at the hotel Avenida with a good bed and hot shower to relax, where the friendly landlord asked me when I left, when I will be back with my kids! I hope to be able to do it with them one day for sure! So I spent the New Year Eve 2009 at the other end of the planet in a middle of nowhere only with strangers… Quite different than my last 5 years all around Europe (2004 – Paris, 2005 – Madrid, 2006 – Budapest, 2007 – Kracov, 2008 – Nurenberg) with my Rostock friends… It was different but great! Light was supposed to be switch off at 10pm but regarding the circumstamces, we could have it nearly up to 2am! Start was a bit slow and our guide – Ramiro – told us that nothing was plan. They were more than 7 different groups with people coming from Argentina, Bolivia, Korea, England, Germany, Spain, France – only me I think! ;) - Canada and I guess I’m missing some! There was a Bolivian bout-en-train who entertain a long part of the evening with different games. We had lot of fun seeing the English singing and dancing while having a forfeit Then the Argentine – who had a guitare – start singing some of the Beatles songs helps by the English group. This was so much fun! At midnight we all huged & kissed and went outside as some people brought fireworks. Just in front of the Salar with a full moon it was just wonderful! 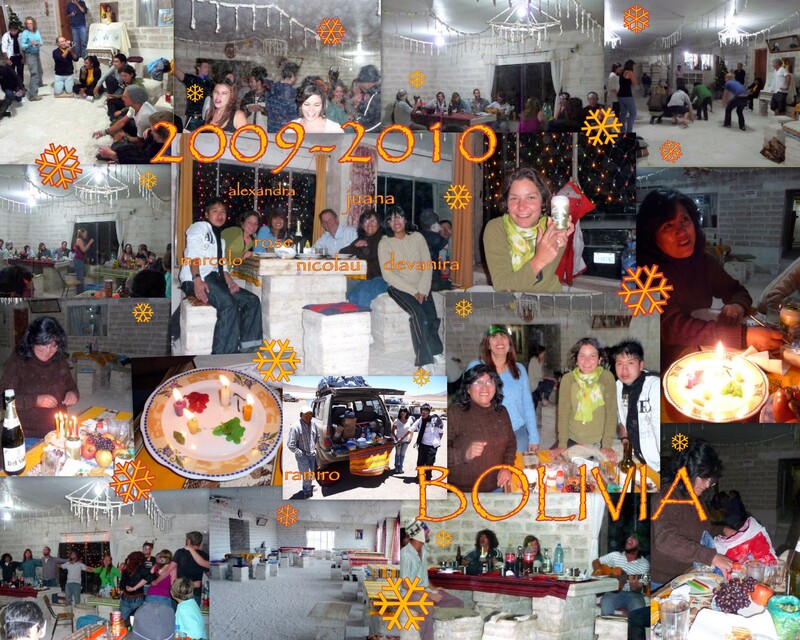 I also learned Bolivian tradition for the New Year with Juana who kindly share everything with us! Here red and green expand themselve as we can spread love and hope all the time… Orange, yellow, white and purple keep pretty straight as we can be healthy or have enough money, work or protection for the time beeing but always need to pay attention to it as it goes and come back easily… Hope you follow everything! After all that and while waiting for the candles to burn – you cannot go to sleep before! 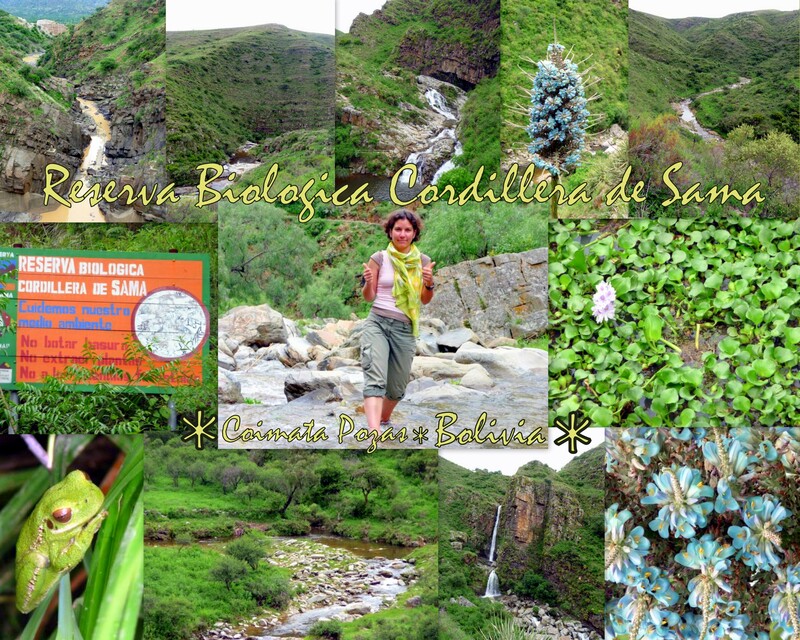 - you eat the food and drink but don’t forget to put 2 or 3 drops on the floor for the Pachamama – La Madre Tierra! This was so great… I don’t know where to start! From the beginning might be the best I’m now in Tarija and just feel like doing this tour again! So… after a difficult start – more than 1 hour waiting on my own at the travel agency without explanation! The thing I hate the most! 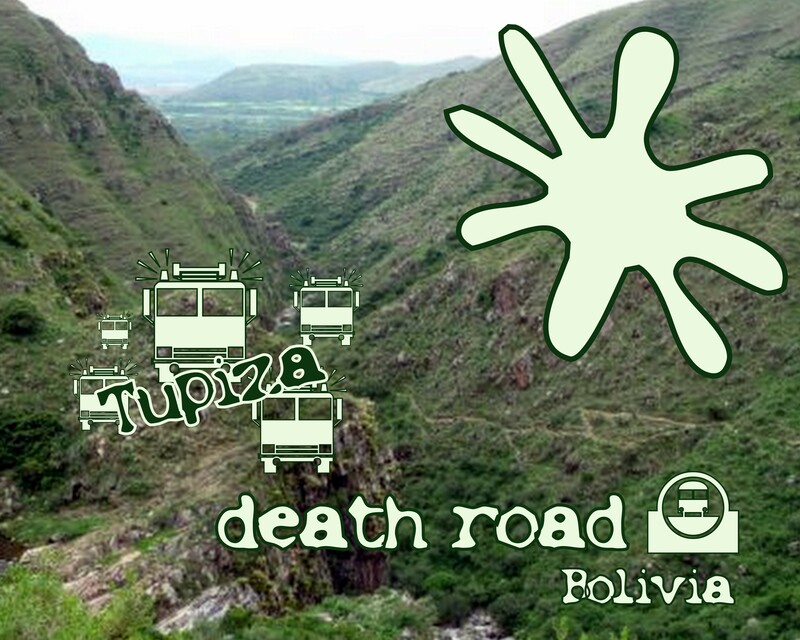 - The jeep finaly arrived and I met our guide Ramiro and my group mates: a family of 3 Bolivians – Juana, Deyanira and Marcelo and 2 Brazilians: Rose and Nicolau. 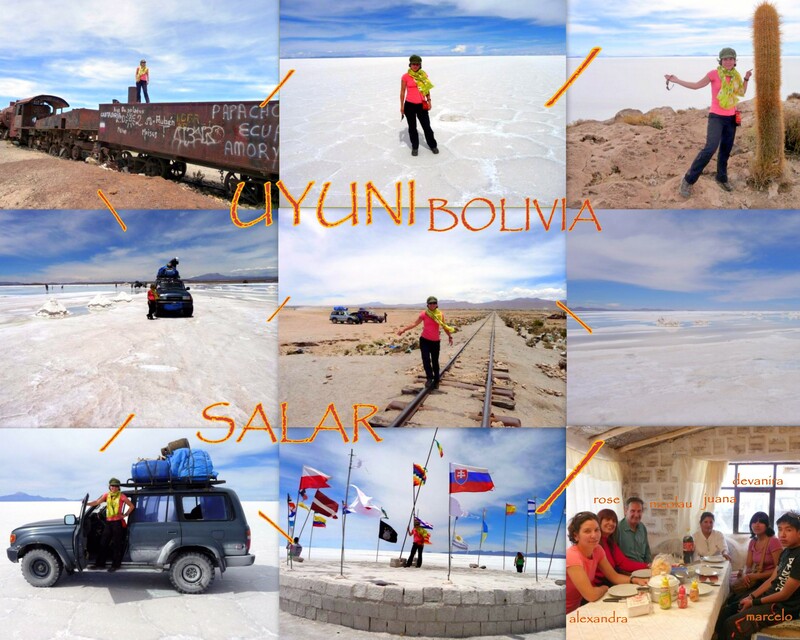 We first visited the Cementerio de trenes few km away from Uyuni and then head to the stunning Salar… So amasing! This huge flat white space - salt desert of 12 500 km2 at 3 650 metres high where water is running under… – all around you… Even with jeeps around, you feel the immensity. This is fantastic! I just love it! 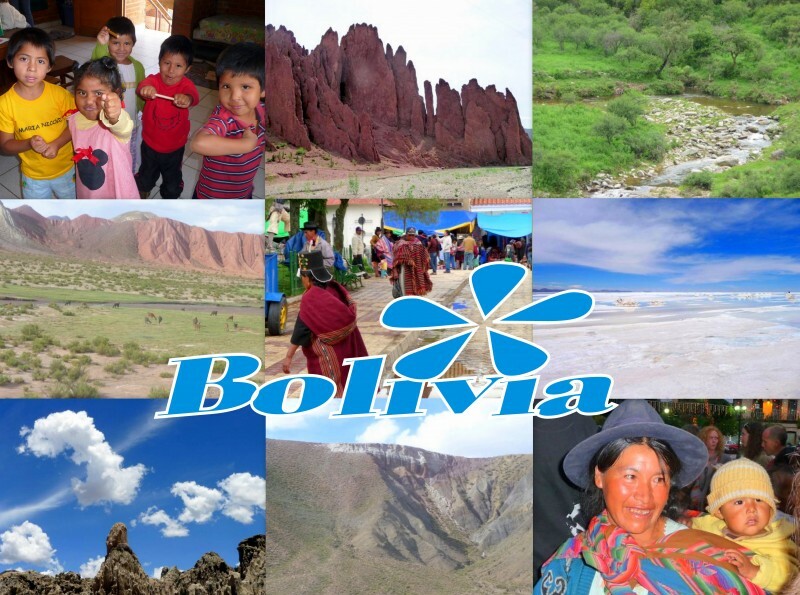 Maybe also because this white reminded me of the snow I missed this year in Europe People from Uyuni and from the Salar borders are the only one allowed to operate it, however this is only exported in Bolivia and not really profitable… Again a hard work which hardly help to survive! We stopped for lunch in the former Hotel de Sal - supposed to be closed as hotel because of hygiene problems - not really sure about that… – But I wasn’t at the end of my surprise… After lunch we arrived at the Isla Inca Huasi - often sale as Isla del Pescado! – Again, such a stunning place… This island in the middle of this white area with… Cactus on it! Extraordinary! Absolutely sublime… Few hours drive more – this is the worse part and even more after 3 days! 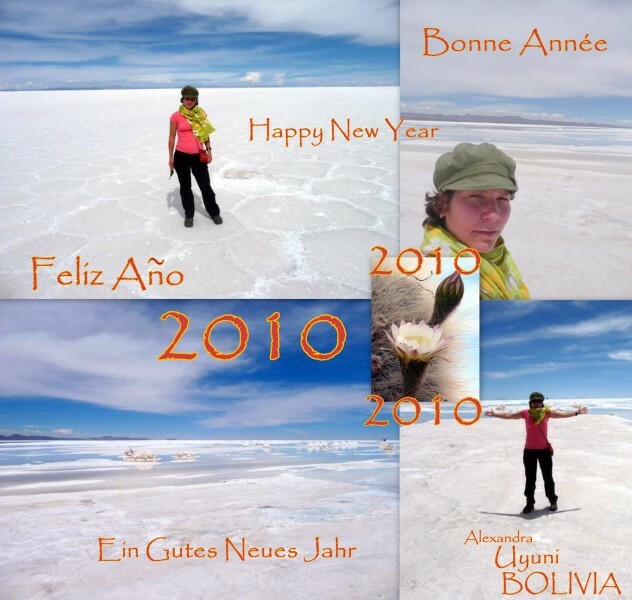 - we arrived at our legal Hotel de Sal in San Juan on the border of the Salar to spend the night and currently the New Year Eve! I wish you all the best for 2010! Coming back from the stunning Uyuni Salar – the most beautiful thing I’ve seen from the world so far… Maybe I need to travel a bit more! After Potosí I head toward Uyuni, such a beautiful landscape all along the way!!! 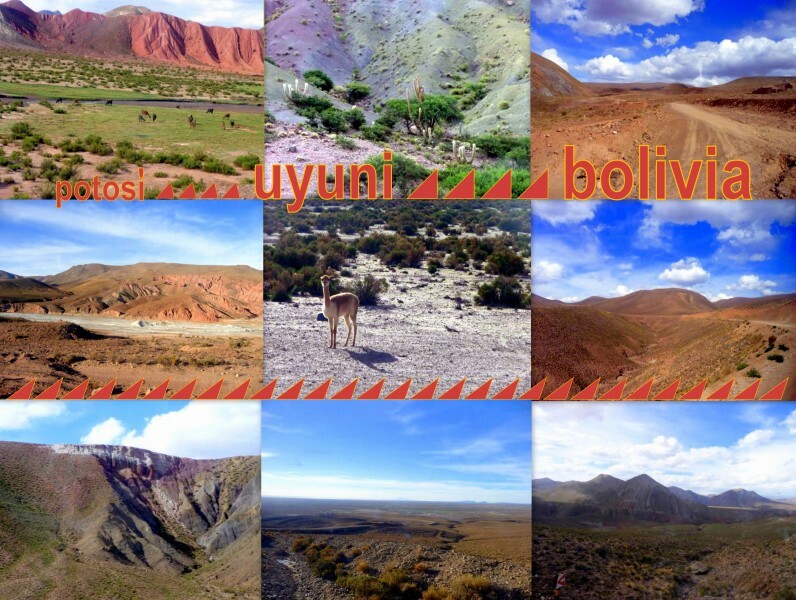 Chamging from mountains to plain at more than 3 000 metres high! Seeing plenty of lamas as well as flamingos! Unfortunately I didn’t had time to take pictures… Way was far too chaotic!!! Also, the trick of the fake policeman doesn’t only apply to tourist! It happened to my young neighbour in a taxi while she was coming to catch the bus from the main bus station… If I get everything right when she explained to people in the bus, she & her friend where robbed of 200 Bolivianos. 3 guys intered the taxi & they couldn’t do anything! For a student – or anyway for anybody else! – it’s hard to take!